Nonaka Miki and Haga Akane are here for our enjoyment today. As they get ready to start, we get an echo from the Maria/Ogata pairing where they admit that, other than small talk, they don’t really talk at all. In honor of the fact that they’re finally going to be talking together, Nonaka, who is in charge today, would like to examine their relationship and how they seem to each other. Nonaka: For me…. Haga-chan is..
Akane: I think this is the first time I’ve heard you call me that. Nonaka: Ah.. yeah… usually it’s Akane-chan.. but anyway..
What Nonaka wants to highlight, is that she loves the way Akane reacts to things. She always reacts loud and dramatically. For example, when she’ll accidently hurt herself, she won’t just say ‘ouch’ normally, she has to call out loudly “OUUUUUCH!! !” So at first, when they had all just met, whenever that had happened the rest of 12th Generation got really worried, asking if she was all right. But now… they don’t react at all to it. Akane: Well… actually, I do talk to myself a lot, so sometimes when I’m really trying to talk to people, they won’t answer me. Nonaka recounts that lately ,when Akane will call out “Haa-chin~” to Ogata, Ogata will just reply with a grunt instead of actually saying anything. They’re just not exactly sure when Akane is talking to herself or actually talking to them. In general, Akane really does talk a lot, but it seems like it really is often her talking to herself. Akane insists though, that there are times she really is trying to talk to them with hopes of a reply. Nonaka then mentions, know that she thinks of it, there are times when the two of them do talk, but Akane quickly mentions that it’s always just small talk. For example, it’s always stuff like “Ah, today’s cold isn’t it?”. They don’t ever have any deep conversations about things. And sometimes one will ask the other to go do something, but it always seems like they can’t go. The two of them decide that next time they’re talking that they will try and have a deep conversation about something. (Translation Note: One of them slips into Kansai-ben here saying “Se ya~ Se ya~” and given the information given to us by last recording, I’m willing to bet it was Akane) They really consider each other as friends, it’s just that they have yet to experience these kind of talks. Akane takes the reins now for a bit to talk about her impressions of Nonaka. To Akane, Nonaka had seemed to be a really neat, organized person. So one time when they were asking to see photos of each other’s room by text, Akane got really excited, wondering what kind of room Nonaka would have and how orderly it would be. Nonaka clarifies a bit, by saying that she randomly really enjoys seeing other people’s rooms. She especially likes seeing clean rooms, nice neat, organized ones, so she sent Akane a text asking if she could see hers. Nonaka: I thought, crap, what am I going to do? Nonaka: I was really at a lost. Akana: I thought so! No reply was coming. Nonaka: “It’s a mess!” is what you replied with. Akane goes on to explain in great detail all the messy parts in the photo of Nonaka’s roomroom. Nonaka defends herself saying that she had sent her a photo of the cleanest part of her room. Akane apologizes for being so blunt when she sent her text reply, but then goes on to talk about how messy it was again. Her image of Nonaka being super neat and organized has obviously been shaken up. Nonaka admits that it’s only occasionally that she gets struck by the need to get all clean and organized. But, when she does get really serious about cleaning her room it takes 1-2 hours to do all of it. She gets it to be incredibly clean. Maybe in the future when she has a boyfriend she’ll keep clean more. Akane recommends that she attempt to start cleaning everyday as practice. For Akane, the girls from Country Girls and ANGERME’s 3rd Generation are who she feels like she became close with. They were always hanging around each other. Of course, they did all have their first Hello! Project Concert at the same time, so it’s like they’re peers on the same level. As for members that she wishes she had befriended, it would have to be any of her senpai since she just hangs out with people who came in with her. Nonaka can’t resist bringing out once again how much Akane loves both Kudou and Takagi. Akane lets out an adorable gigle as soon as they’re mentioned. Nonaka: Even now, just by mentioning it your face gets all happy. If this was an American High School drama, Akane would have her locker covered in photos like this. Akane gets really nervous when she tries to talk with either of her idols. So when the rest of 12th Gen are trying to support her and pushing her towards one of them, she freaks out. Nonaka assures her that it’s very adorable. They will try and talk with their senpai more, starting with the upcoming Morning Musume ’15 spring tour. Akane was still too young when the first and original PreCure series was released, so she hasn’t really seen it, but from the third or fourth generation of the series she’s been watching it. Thus, when it comes to this “All Stars” movie, she actually knows most of the characters. Because of this, when she first heard she was incredibly happy about it. Nonaka actually remembers Akane looking ecstatic when they’d first heard the news. For Nonaka, she was really into the first generation, with Black and White. She asks if Akane understands what she’s talking about, and Akane insists that she does know of the series, she just hasn’t watched it. Nonaka theorizes that Akane was probably around three years old when it first came out. Nonaka is amazed that even though they’re only three years apart, there is this generation gap between the two of them. Akane tells her not to say things like that. Anyway, when Nonaka was watching PreCure, she actually was living in the United States. Because she loved the series so much though, her grandmother was sending her DVDs of it. She also would dress up as White from PreCure for Halloween to go trick’or’treating. One year she happened to have her photo taken and was printed in the newspaper. Akane: Ah~ I want to pick up that newspaper. Nonaka: I have it. I’ll send it over to you. Nonaka is really excited though to be wearing the same costumes as the PreCure characters again. It’s like they’re really becoming PreCures. They both, of course, really wish they could become PreCures in real life. Nonaka, to Akane’s pleasure, adds for Akane being a PreCure would really fit her. Akane’s really happy that they talked about something other than the weather today. 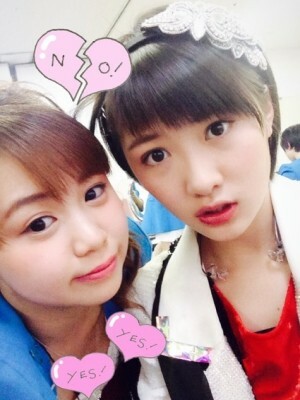 Nonaka agrees. Akane: We should go do something on the way home. Nonaka: It seems that Akane-chin and I are getting to become friends~ Yay!